The Ventoux (formerly Côtes du Ventoux) appellation lays between the area designated as Côtes du Luberon (now Luberon) in the south and the massive Mont Ventoux to the north. It is a large appellation covering some 50 communes over an area of 5800 hectares and producing over a quarter of a million hectolitres of wine annually. I always like to stress the point that most people keep drinking the same 2 or 3 grapes from the same 2 or 3 countries over and over and over. Many Yellow Tall Fans ask me where the Grenache Shiraz blend is and I ask them if they have tried wines from the Southern Rhone which are mostly comprised of Grenache and Syrah?? Most of them think That a Rhone is a 5k marathon. The Southern Rhone Valley has many famous appellations like Cotes Du Rhone, Gigondas, Visan, and the most famous and most expensive Rhone Chateauneuf Du Pape. But if you are like me, you’re having a little BBQ, Hamburgers, Chops, Chicken etc and you are BROKE LIKE ME and you need a solid wine that doesn’t break the bank. On your own, you go with the familiar like Yellow Tail Grenache/Shiraz Blend. The wine above comes from an area that formerly was known as the Cotes Du Ventoux (VANT-TO) and now it is the artist known as PRINCE JUST KIDDING. It is known Just as VENTOUX. 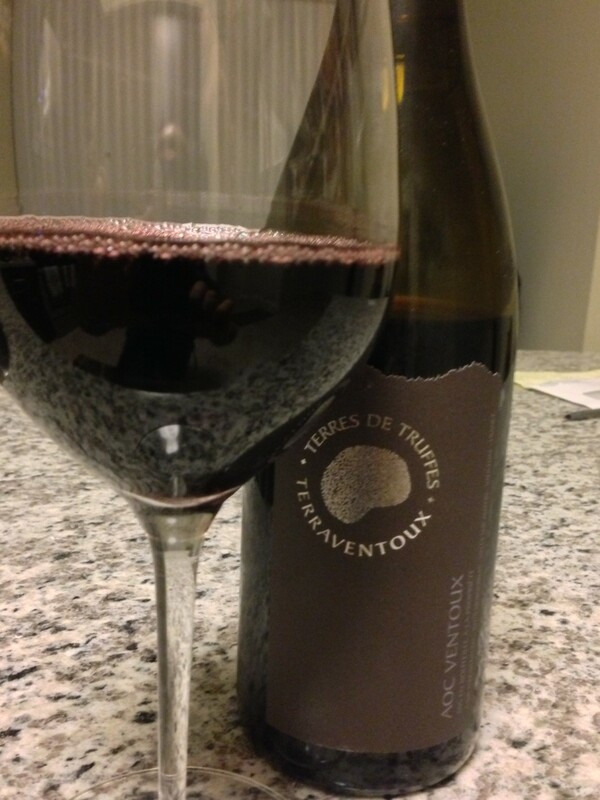 The Terre De Truffes gets their fruit from vineyards in the Ventoux Appellation. It cost me $12 and is a 50/50 Blend of Grenache And Syrah but with a helluva lot more character than a bottle of Yellow Tail. Dark in the glass. Beautiful Black Fruit Aromas and a hint of TRUFFLES (Hence the Name Terre Des Truffes) On the palate, this offered really good Bang For The Buck. Ripe, Juicy Blackberries, Black Pepper Spices, Some Herb Flavors and a hint of spice with very Ripe, somewhat DRY TANNINS (WHICH IS WHAT YOU WANT FOR A BBQ or A JUICY BURGER). Overall, I liked the wine and to tell you the truth if you told me it was GIGONDAS a much more Expensive Southern Rhone Grenache/Syrah Wine I would believe you…AND….THAT MY WINE BLOG READERS IS WHAT I AM ALL ABOUT….QUALITY TO PRICE RATIO!! NextSHARING Wine With Friends Makes it Taste So Much Better!